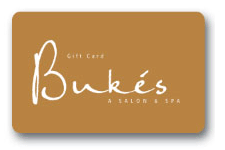 Give a gift of relaxation, beauty & wellness with a Bukés Gift Card. Our gift cards are tailored to each recipient and may be spent on various merchandise or Salon Spa services. You can also add value to an existing gift card at any time to bypass the checkout procedure.